Start: Find you latitude. e.g. 6.5 deg north. Input this to the calculator together (optionally) with the longitude, say 3.5. If you input your longitude put the same figure also as the satellite orbit location as this will give additional azimuth-elevation angles for a hypothetical satellite due south of you. The MAIN MOTOR AXIS BEARING angle must be 6.7 degrees. 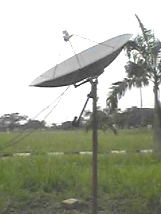 The SMALL DOWNWARD TILT ANGLE of the dish must be 1 degree. Viewed from the east, facing west. The actuator is centralised and the dish is aimed at the highest satellite, due south of you on the same longitude, elevation angle 82.33 deg and azimuth due south ( 180 deg true bearing ). Moving the actuator either way will tip the dish sideways and downwards towards the east or towards the west. Main axis angle = 6.68 deg. Slight downwards tilt of the dish = 1 deg. The dish is attached at B, shown by the blue line. The dish needs to be tilted down 1 deg by making distance A fractionally shorter than distance C.
Measure B and C, calculate A, and then set A exactly. The entire head unit must be rotated on the pole and clamped so that it is aimed due south, to the left in the diagram. In the older image on the right, the top piece is horizontal right now, which is wrong. Is there any way it can be tilted up on the right hand side? Does the pink screw adjuster, as suggested in the diagram, exist ? What are the two apparent "end of bolts", as marked, for ? Is the main axis bearing line along the green line or does the mount rotate above an axis line higher up ? More news when we hopefully get it to work !! Eric Thanks. I tried out what you said and presently get about 100 FTA stations (whoa) while about 30 are scrambled. Thanks once again. I hope others use my situation as a case study in setting up theirs. Hi, Eric, USN and Co. Its been a long time. Hope all is well. Anyway, I have finally set up my Dish but have a little problem. I view some channels presently thanks to you guys but I noticed that some stations which I would love to watch show a quality of 30% and so don't show. I feel this might be due to the angles I couldn't set. I found it easy to adjust the tilt angle to 1 deg but since the pole mount is cemented to the ground I can't adjust it to the elevation angle of 6.7 deg. Can I simply adjust where I was meant to set as 1 deg to 7.7 deg as it is the only adjustable part of the dish set up. 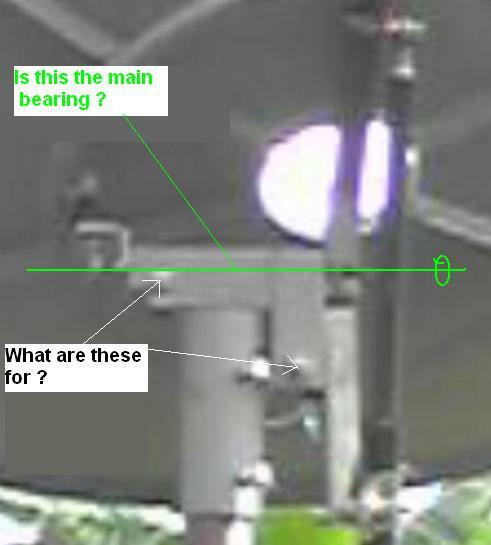 It is to be expected that signals from some satellites will be took weak to be displayed - even if your mount is set up OK.
Is these any chance you could take several close up photos of the mount mechanism and actuator motor so we can understand better?. There is much variety in polar mounts. Reduce the jpg file size to about 25k-35k for transmission. Your linear actuator may have two alternative positions. On one side or the other. In each case it may swing the dish perhaps 120 deg or so. In your location almost 180 deg of movement is involved as you swing from the east horizon, via almost directly overhead and down to the horizon in the west. I have sent pictures of my set up to your e-mail address. I tried to take them in a way that you will understand the 3 dimensional placement of the dish. Does the bracket make sense ? Believe me, your construction was great. Now I got that 1deg tilt perfectly but the 6.7 deg tilt is the problem. The head unit attached to the polar mount is T-shaped and fits into the pole straightaway without any opportunity of adjusting it. I sent a picture of it now to your e-mail. How do I get to tilt the head unit just as you did in the diagram (the pink diagram) as the pole is fixed to the ground and that unit cant be adjusted. I've added a picture of the L shaped metal at the top of the pole. I don't understand how this L shaped metal is fixed to the pole. What are the two bolt heads for ? What can't it be tilted up at the right hand side ? Has anyone seen one of these before ? Your diagram from the actual pictures I sent to you have solved all the problems I had. I thought that joint was a T- joint that should not be adjusted and rather the head unit as a whole. I now know where to tilt to 6.7 deg on the main bearing. God, I am very grateful. I will put all I have to do as you have shown me. I owe it to you and how much you have been helping us. The result will be out as soon as possible (latest on Saturday). I owe you one. God bless. By the way, on NSS 7 there are many FTA stations within my coverage area. I get all of them except a station called 2M Maroc (4.055R, 27500).What could be the problem. I was hoping to help record sports programs as indicated on your website and this station is listed among the stations needed and I am sure I am within its coverage area and on www.satcodx.com it was recorded as active even today.